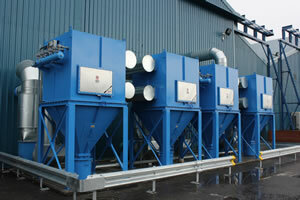 Over many years we have designed and supplied localised and general building extraction to handle welding fumes. For one client we had over 60 localised welding fume extraction arms, each handling welding fume, grinding dust and each system had external reverse jet cartridge filters with explosion relief. We are currently involved in the design of a localised welding fume extraction system for a training school with up to 25 off welding stations; the extracted welding fume will be separated in a cartridge filter with debris collected in polythene bags. Air from the cartridge filter can be returned into the workshop area.